A flock of American Crows provided some drama on Sunday, Nov. 23. 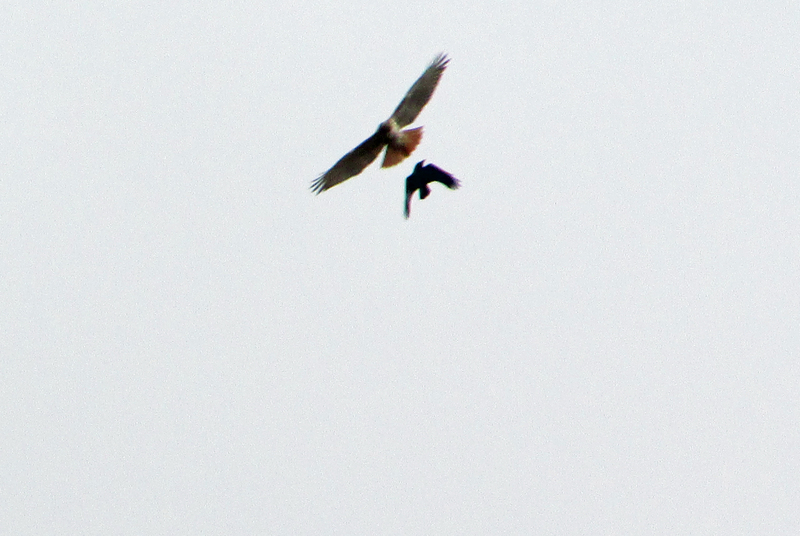 The crows, perhaps with good reason, didn’t appreciate finding a Red-tailed Hawk in their airspace. The flock spent around 20 minutes directing an aerial bombardment against the hawk, which finally got the hint and moved out of the territory claimed by the crows. Photo by Bryan Stevens An American Crow mobs a Red-tailed Hawk that intruded into its territory. Photo by Bryan Stevens This Gray Catbird, photographed on Nov. 23, represents a fairly late record of this species in Northeast Tennessee. Most catbirds migrate out of the region each fall to spend the winter farther south. In addition to the fun observation with the hawk and crows, I discovered an unseasonably late Gray Catbird in my yard. I actually heard the catbird’s namesake cat-like scold vocalizations before I saw the bird. Catbirds are common birds in my yard from spring to fall, but they usually depart in early October. I thought that was the case this year, too, but then this straggler showed up. 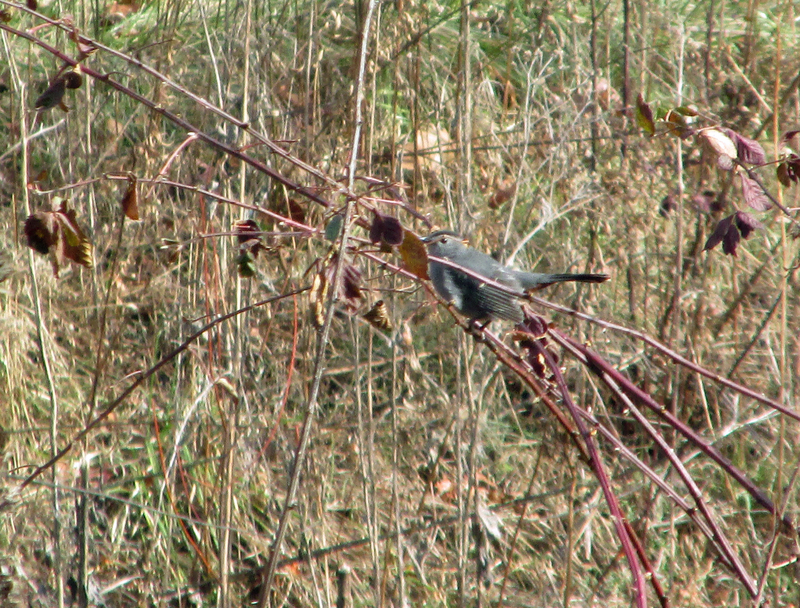 The catbird has put in some other appearance since its initial appearance on Saturday, Nov. 22. In recent years, catbirds have been found on several of the Christmas Bird Count conducted in Northeast Tennessee, so it’s a distinct possibility that a few of these birds have taken to spending part of the winter here rather than flying south. With the recent cold weather, I’ve been seeing a few golden-crowned kinglets, as well as the closely related ruby-crowned kinglet, at my home. Photo Courtesy of Jean Potter A Golden-crowned Kinglet is held securely during a bird-banding procedure. The crown of golden-yellow feather that gives the bird its name is clearly visible. Both the golden-crowned and ruby-crowned kinglets are members of a family of tiny birds known collectively as kinglets and firecrests. They’re such tiny, energetic birds that they absolutely excel with the “cuteness” factor. 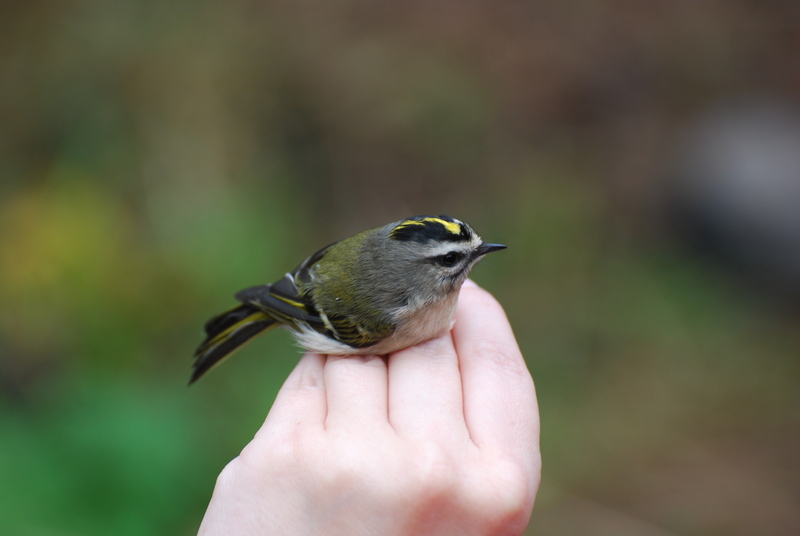 All kinglets are very tiny birds, as well as extremely active ones. They are also the only members of this family of birds found in North America. Four other species, however, are native to Europe, Asia and North Africa. The remaining species include goldcrest, common firecrest, Madeira firecrest and flamecrest, which is also known as the Taiwan firecrest. Photo by U.S. Fish & Wildlife Service Only the male Ruby-crowned Kinglet shows the small patch of red feathers atop the head that gives this bird its common name. 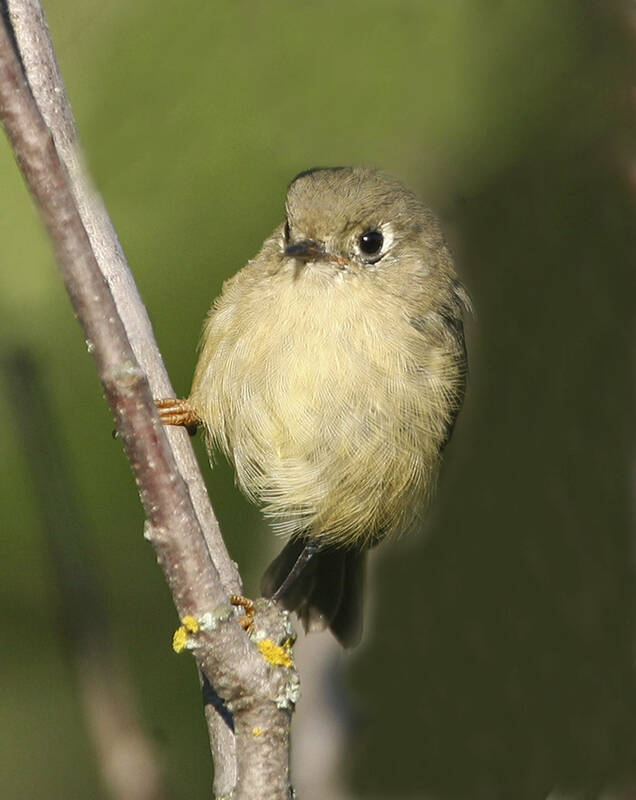 Kinglets, as their name suggests, are tiny birds. In fact, about the only North American birds smaller than kinglets are some of the hummingbirds. The kinglets belong to the family, Regulidae, and the genus, Regulus. The family and genus names are derived from a Latin word, regulus, which means “rex,” or “king.” The name was apparently inspired by the colorful crown patches, often red, orange or gold, that resemble the royal “crowns” of kings. Although similar in size and overall coloration, the ruby-crowned and golden-crowned kinglets are easily distinguished from each other. Side by side, the two species of North American kinglets are easy to identify. The golden-crowned kinglet has a striped facial pattern formed by bold black and white stripes. The ruby-crowned kinglet, on the other hand, has a bold white eye ring but no striping. The golden-crowned kinglet has an orange crown patch, while the ruby-crowned kinglet has a red crown patch that is, more often than not, kept concealed. Both sexes of the golden-crowned kinglet possess a yellow crown patch, but only the male ruby-crowned kinglet boasts a scarlet patch of feather atop the head. 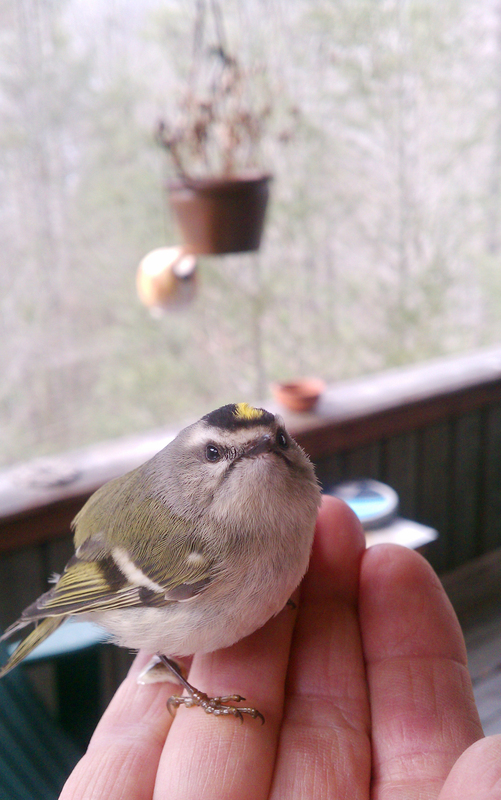 Photo Courtesy of Beth McPherson This Golden-crowned Kinglet was in good hands as it recovered from striking a window. Kinglets are active birds, foraging vigorously for small insects, and spiders. When foraging, both kinglet species have a habit of flicking their wings over the backs. Even if you can’t get a good look at the birds, this behavior helps contrast them from other small birds, including some warblers, wrens and the blue-gray gnatcatcher. Golden-crowned kinglets are widespread in the region during the winter. During the summer months, head to the slopes of some of the region’s higher mountains to look for these tiny birds that nest at the higher elevations of the Southern Appalachians. 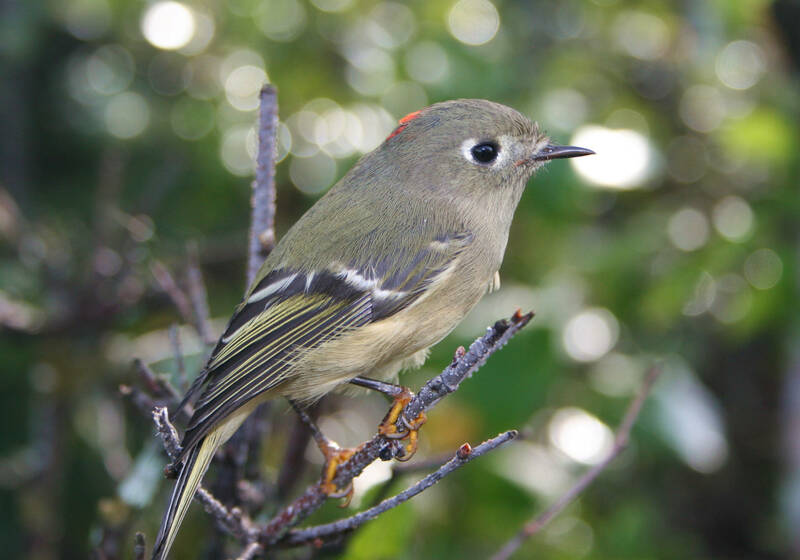 Ruby-crowned kinglets can also be found in the region during the winter, but extreme cold weather will often force these less cold-hardy birds to eke out the winter months farther south. Photo by U.S. Fish & Wildlife Service A Ruby-crowned Kinglet forages for insect prey in the branches of a small tree. Kinglets don’t typically visit feeders, but they do tend to join mixed flocks with membership consisting of such species as tufted titmouse, Carolina chickadee and white-breasted nuthatch. When traveling with such flocks, kinglets may visit the space around feeders but rarely take seeds or other fare offered at feeders. Kinglets are surprisingly tame at time and often exhibit as much curiosity about us as we display toward them. They’re very active birds, however, constantly moving from perch to perch. These bursts of hyperactivity can make them difficult to observe since they so rarely remain still. Although small in size, these birds more than compensate for it with a feisty spirit that does them well through the harsher weather of the winter months. This entry was posted in Birding, Birds, Our Fine Feathered Friends and tagged American Crow, Bird mobbing behavior, Carter County Compass, Elizabethton Star, Firecrests, Gray Catbird, Kinglets, Red-tailed Hawk, Regulidae, Winter birds on November 30, 2014 by Bryan Stevens. Thanks for the post on kinglets. I have one in my yard. I have a special caged suet feeder for him so he can eat without having to compete with bigger birds. Sweet little bird. Always thrilled to see him.